How does this technology impact 5 G and will it replace Wi-Fi? Imagine downloading a movie from a light bulb. With light fidelity technology, (Li-Fi) a type of wireless technology, you will be able to do just that. Li-Fi uses both the infrared and visible light spectrum to deliver high-speed data communication. 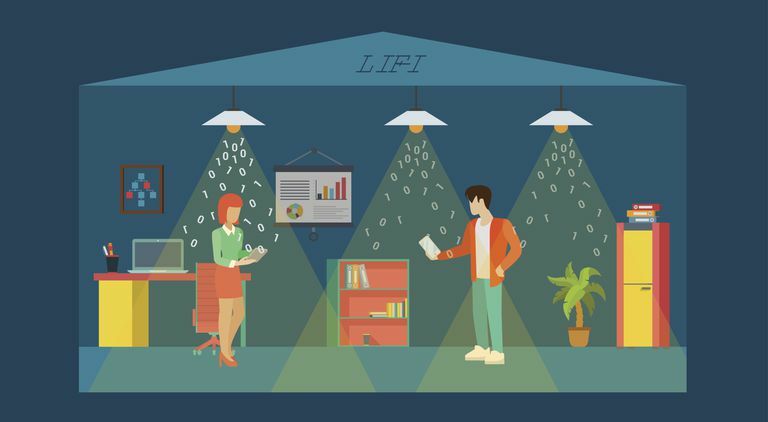 Unlike Wi-Fi, which uses radio signals to send information, Li-Fi uses a network of light-emitting diodes (LED light bulbs) to transmit data. While Li-Fi may sound unusual and rare, you are already using Li-Fi technology whenever you click your television remote. The term Li-Fi was first used by University of Edinburgh professor Harald Haas in 2011 during TEDGlobal, when he asked, "what if every light bulb in the world could also transmit data?" He explained how the flickering of the light from a single LED, can efficiently and securely transmit far more data than a cellular tower. Haas went on to create a company to develop the Li-Fi technology, called pureLifi to create a plug-and-play system that works with USB devices. LED light bulbs used in a Li-Fi network contain a chip, a signal processing technology, that causes the light to flicker, similar to a strobe light. This constant rapid dimming, which is undetectable to the human eye, is used to create an electric signal by the Li-Fi receiver to transmit data. LED light bulbs are ideally suited for Li-Fi, because unlike fluorescent and incandescent light bulbs, LEDs have the high intensities needed to achieve very large data rates. 5G is the name given to the latest sequence of cellular mobile connections, which gives increasingly better performance speeds than the 4G (LTE/WiMax), 3G (UMTS) and 2G (GSM) systems. 5G wireless devices transmit data by radio waves with a local antenna array and low power automated transceiver. The local antennas are connected with the telephone network and the internet by a high bandwidth. 5G is 100 times faster than the 4G. This increase in performance is achieved by using higher invisible radio waves. In contrast, 4G, 3G, and 2G networks used lower frequencies in the microwave band. Unlike 5G and previous networks, Li-Fi uses radio waves in the visible spectrum, which are much faster and have far more bandwidth. How Powerful is Li-Fi Technology? Li-Fi transmits data at 1 GB per second, which is up to 100 times faster than conventional Wi-Fi. By using the infrared and visible light spectrum, Li-Fi is approximately 2600 times the size of the entire radio frequency spectrum of 300 GHz. In contrast, Wi-Fi has a limited number of radio frequency bands available. This is important as homes, and businesses purchase wireless gadgets and rely on Internet of Things (IoT) technology. This increase in demand is making it much harder to move data over the limited number of bands. Some sources say that by 2020, there will be more than 50 billion devices that would be always connected to the rest of the world. This is compounded by the fact that 5G requires a large amount of radio spectrum. Pushing some of this demand over to Li-Fi frees up more radio spectrum to handle our growing internet traffic. With a Li-Fi processing chip, an LED lamp becomes a network access point. A binary data stream is fed from the internet or server through a high-speed medium via a router and then into the lights. The LED routers then modulate the output to embed the data into the light. Your device will need a photosensitive receiver, or a dongle that plugs into a USB port, to access Li-Fi. Light can be secured in a physical space. In the same way that your TV remote cannot penetrate walls, Li-Fi's reach is restricted by walls, floors, and other physical barriers. Data cannot be intercepted without a clear line of sight, making it more difficult for hackers to get into your internet. This limited range makes Li-Fi ideally suited for data-sensitive applications, such as military and healthcare. Multiple users can use the same Li-Fi bandwidth without interference, as Li-Fi offers absolutely no electromagnetic interference. This makes it possible to have internet connectivity in areas where Wi-Fi is dangerous, making it suitable for chemical or nuclear plants. Li-Fi can provide internet access in areas where radio waves can't reach, such as in subways, underwater, and in airplanes. The lights must be on for Li-Fi to work. Li-Fi requires a clear line-of-sight connection, just like your TV remote. Your device will always need a clear pathway with the Li-Fi transmitter, which could make it difficult when you are on-the-go with your mobile device. Light bulb manufacturers must be convinced that adding the extra circuitry to their LED bulbs to allow for the flickering will be worth the added expense. In addition, a Li-Fi network will require internet cables running to the LED light fixtures that are part of the network.